When Darby McPhee falls in love with Cayo Bradley, a wild cowboy from a nearby ranch, her world is ripped apart. Caught in a lifeless existence of caring for her father and brothers since her mother’s death, Darby does little else but work. But a death-bed promise to her mother to get her education now stands in the way of her heart’s desire to belong to the rough-and-tumble Cayo Bradley. Darby is Cayo’s redemption from a horrific act in his past that torments him. After being captured as a young boy by the Jicarilla Apache, he now tries to settle back into white society—but how can he? If he loses Darby, he loses everything. Romano’s story sizzles with the tension of lovers—one struggling to blend Apache ways and white, the other torn between East and West—searching for a way to join two lives going in opposite directions. 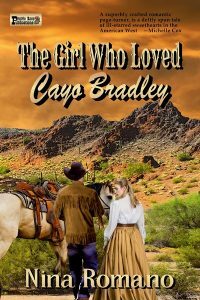 The Girl Who Loved Cayo Bradley, a superbly crafted romantic page-turner, is a deftly spun tale of ill-starred sweethearts in the American West. Darby, a charming farm girl, and Cayo, Apache raised, a secretive man with a disturbing past. Sparks ignite, burning intensely despite cruel circumstances to separate them—an expertly woven story with witty dialogue, fast-paced plot, and stunning, enchanting prose! — Michelle Cox, award-winning author of the Henrietta and Inspector Howard series.